This French Built Fiberglass Dufour 35’ is roomy and comfortable, seaworthy and easy to sail. She has two cabins. The private forward cabin has an offset double berth and hanging locker, the main cabin has sleeping for 2-3 people with storage above the berths and a center dining table that can be converted to a double berth. The large head with hanging locker is the full width of the boat, allowing room for use of sun shower direct to inside. The galley to port is equipped with 2 double stainless steel sinks with foot pump and a large ice box. The gimbaled 2 burner propane stove with oven has a safety rail, strap and storage below. There is a large chart table to starboard. She is powered by a Yanmar® 35 diesel engine. 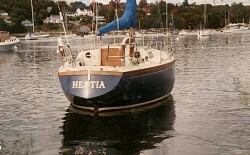 She has a flush deck, large cockpit, tiller, spade rudder and fin keel. She has two cabins. The private forward cabin has an offset double berth and hanging locker, The main cabin has sleeping for 2-3 people with storage above the berths and a center dining table that can be converted to a double berth. Quarter berth starboard of nav station(ok for child), The large head with hanging locker is the full width of the boat, allowing room for use of sun shower direct to inside. New toilet installed 2013. All bededng and towels included. The galley to the port is equipped with 2 double fiberglass sinks with foot pump and a large ice box. The gimbaled 2 burner propane stove with oven has a safety rail, strap and storage below. There is a large chart table to starboard.